We’re savouring the last of our figs in this delicate, fragrant mousse. My husband decided that 346 pots of jam was probably jam enough to last until next year ;-). Not a moment too soon if you ask me – I’ve been able to reclaim my kitchen. Combine the yoghurt, figs, lemon zest, ginger, honey and rum and leave to chill. Whip cream to until stiff and gently fold in with the chilled fig mixture. Serve immediately for mousse OR spoon into a mold and freeze for frozen mousse. 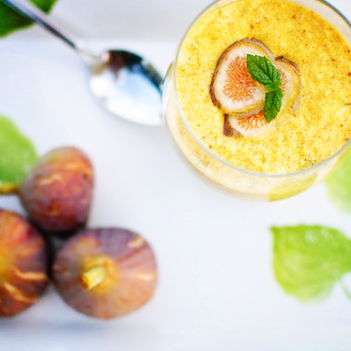 This entry was posted in Sweet and tagged Fig and honey mousse, ginger, healthy fig mousse, honey, low-GI mousse. Bookmark the permalink.